Welcome to our Corgi Gifts page. Here you will find unique gift items for the Corgi lover that you won't find anywhere else. 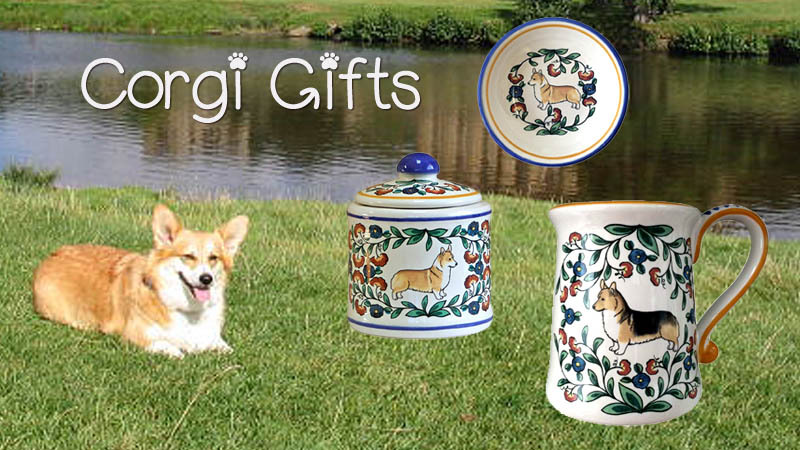 We create all of our Corgi products using our original artwork and pottery made here, in our Northern California studio. So you can be sure that you are buying gifts made with joy and care, in America. We know that it is important for you to find items that represents your Corgi well, so we offer a variety of Corgi coat colors to choose from (red and white, tricolor, black headed tricolor and others). If our standard coat colors are not specific enough, you can have your Corgi merchandise customized to better reflect your own Corgi's colors and markings. Simply choose the "custom" option on the item's page and follow the directions (a s mall art fee will be applied to all custom orders). Each piece displays a cute Corgi surrounded by a colorful floral pattern, with hand painted accents of cobalt blue and golden yellow. The Corgi design, combined with the Mediterranean style, can't help but make you smile. And while our pottery pieces may look like they require special handling, they are very durable. Our Corgi merchandise is made of stoneware and intended for everyday use, and are not just beautiful items to be displayed on a shelf (although they're quite happy there too). So feel free to use your Corgi items in the oven, microwave, and dishwasher. The Corgi has some very notable distinctions – herding dog (watch it take on 100 cows), favorite mount of fairies (according to Welsh legend), and the preferred dog breed of the Royal Family since 1933. These little dogs have very large souls and are very popular. Just as an example, the Southern California Corgi Meet Up in Huntington Beach had over 600 Corgis in attendance. What is it about this breed that makes it so popular? For starters, just look at it. The Corgi oozes cuteness from every pore – it's small stocky stature and Corgi waddle, it's wavy coat, it's big eyes and ears. Not to mention, the Corgi is a very loyal breed that loves to have fun. Our Corgi Gifts have been very popular since the beginning of Shepherds Grove, and we do our best to celebrate this wonderful breed. We trust that you will find something very special for the Corgi lover in your life!